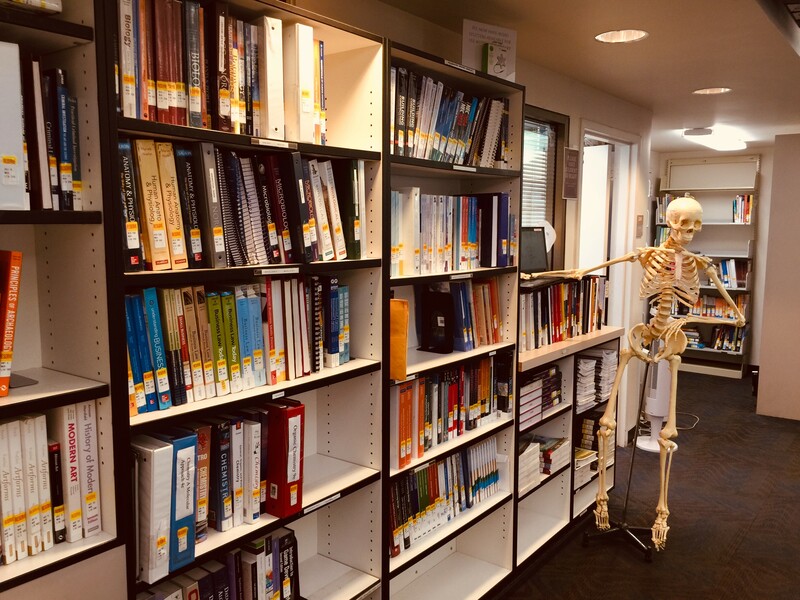 The library has over 650+ reserve textbooks / materials that are available for students to use for a check out period of 2 hours. Reserve materials must be used within the library and are limited to one reserve item at a time. (Always refer to your syllabus for the required text title). Click on the link below and enter the three letter course name and course number (The drop down menu should be set to Norco Library). - 70 PC's equipped with MS Office, Adobe Creative Suite, Virtual Studio 2015. - Computers are available for 2 - 2-hour sessions per day, Login required with student ID, Community computers are available, ask us for more details. 2 hours loan policy. They must stay in the library. After you hit print you should see this a popup (with a paw print) asking for a username and password. To print your papers, enter your username and password you just created at either print station in the library. Insert money and press “print”. Sorry - no fax, scanning, or wireless printing at this time. Plug in multiple laptops and work together on assignments requiring a computer, like presentations! If you need cables to connect, ask us. Stations are for groups of 2 or more. Students not using the station must give up the station to students that would like to use it. To use the tables, first make sure the table is "on". You can do this by looking for the power button that is located on the media well in the center of the table. If the light is white, press the button once to activate the table and the light will become green. You will need a VGA connection to your computer, or you may borrow one of our laptops. Laptops are connected to the tables using PUCKS. Connect the Puck to your laptop (The Puck will glow). Share what's on your laptop by pressing on the Puck. To disconnect your device, press the off button and disconnect the Puck. * In the display settings for your computer, set the resolution to 1366 X 768 or lower. You can now reserve a study room or use our first come first served rooms. 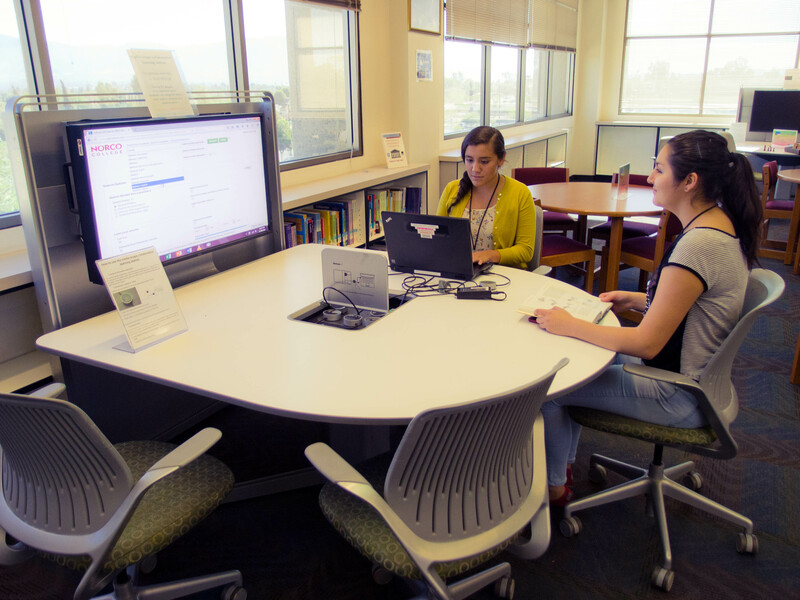 All study rooms require you to check in at the circulation desk with a current Norco College/RCCD card. For reserved study rooms, the student who reserved the room must be present with their student ID and email confirmation for check-in. Rooms will not be held after 15 minutes after the start of reservation. Reserve a Study Room Now! Your room must be checked out at the Circulation Desk, and your key should be placed on the table in the room while occupied. You must be a current student with a student ID card to check out a room. Room checkouts are for a maximum of 2 hours. Maximum of 8 people in the room. No pagers permitted in the room. Food, open drinks or excessive noise will result in loss of room privileges. Whiteboard markers and eraser are available for check out. Clean up all trash and erase whiteboards, leave the room like you’d like to find it! You must vacate the room within the time permitted to you. The student who checked out room is responsible for rule enforcement. Discipline Process: 1st strike: verbal warning; 2nd strike: 2 weeks of no study room checkout; 3rd strike: 1 semester of no study room checkout and meeting with the dean to discuss discipline.